Old friends of China cultivated by the CCP International Liaison Department come in handy in the Huawei dispute, despite the issue being somewhat outside of their regular competences. Sinopsis Czech-language coverage of Huawei here. See also: A New Comintern for the New Era: the CCP International Department from Bucharest to Reykjavík, by Jichang Lulu and Martin Hála (16 Aug 2018), also published on China Digital Times. The defense of Party-state technological champion Huawei in the Czech Republic is increasingly led by a favorite CCP interlocutor: the leader of the Czech Communist Party, Vojtěch Filip, known as “Falmer” during his time as a (supposedly unwitting) Czechoslovak secret police agent. Shortly after president Zeman defended Huawei against the advice of Czech intelligence, Chairman Filip announced he would travel to China in person to ‘iron things out’ in the Huawei case. The PRC Party-state feted the visiting emissary, throwing its weight behind one of the few remaining voices in Czech politics that dismiss concerns over Huawei. The timely deployment of an ‘old friend’ and comrade Vojtěch Filip illustrates the importance the CCP attaches to ‘friendly contacts’ and the cooptation of even minor politicians, notably through the Party’s International Liaison Department (ILD). Filip is a rather unpopular politician and his party hasn’t fared well in recent elections, but the Babiš government still depends on its support. Political cooptation tactics, described as a form of international United Front work by one of its key practitioners, are, together with discourse engineering, among the foreign policy tools that allow the PRC to effectively exert influence even in the absence of significant investment or other economic leverage. This post summarizes information about Filip’s visit, including his three meetings in his official capacity as first deputy speaker of the Chamber of Deputies. As the visit was not approved by the Chamber and Filip was supposed to travel as a party, rather than parliamentary representative, he claimed on the record to have worn the Deputy Speaker hat only once, in the only official meeting reported to the Czech public. The prompt support PRC officials and propaganda organs bestowed on Zeman and Filip in their defensive acts further belies Huawei’s claims of independence from the Party-state. The links between such Party organs as the ILD and Huawei are remarkable for a private business in the Western sense. The overlap goes beyond the Czech Republic: the first post in this series covered interactions between the ILD, Huawei and Marek Suski, the head of the Polish PM’s cabinet. (Polish politicians are now asking questions about Suski’s gift Huawei phone; he denies using it.) We and others have also noted Huawei’s global cultivation of politicians, academics and think-tanks globally, again joining the CCP’s larger discourse-engineering efforts. Huawei’s sponsorship of such think tanks as Brookings Institution and Chatham House are worth mentioning in this regard. The response from the political establishment in the Czech Republic has been lukewarm, or outright negative. Even politicians previously supporting Zeman in his China endeavors seem to have been taken aback this time. The only other person openly jumping to Huawei’s rescue was Vojtěch Filip, leader of the Czech Communist Party (KSČM). The day after Zeman’s interview, Filip, whose usual contacts in China mostly consist of the CCP International Liaison Department and various UFWD outfits, announced a four-day China trip to smooth out the case with persons or entities he would not identify. Sinopsis has now identified some of those entities, of which “Falmer” himself chose to mention only two. “Falmer”’s China trip, which he indicated was “mostly” paid from his own pocket, featured attractions unavailable to most private travelers. Xinhua reporting on Filip’s meeting with Wang Dongming, discussing, inter alia, deepening of contacts between legislative bodies. As he later mentioned in an interview with Czech state radio, he had a meeting with National People’s Congress (NPC) Standing Committee vice chairman Wang Dongming 王东明, in his capacity as deputy speaker of the lower house of Parliament. In the interview, he asserted that this had been his only meeting in such official capacity. However, official reports record his official parliamentary capacity at another two meetings. 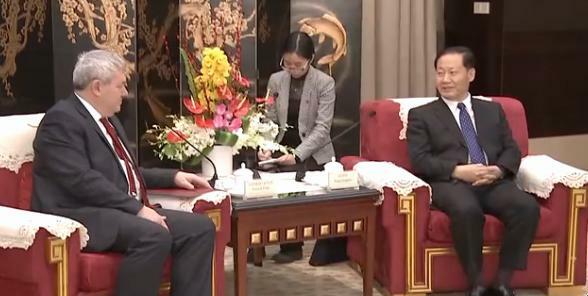 He met, as we expected, ILD vice “minister” Guo Yezhou 郭业洲. 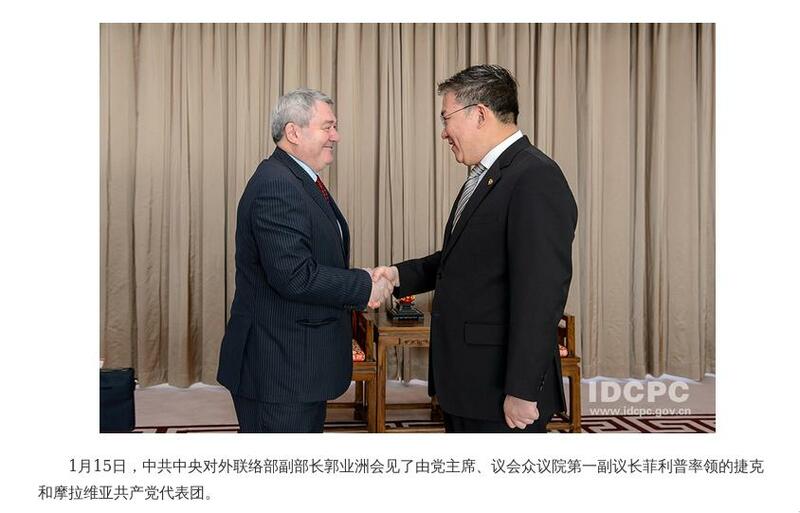 Filip was also identified in his capacity as deputy speaker at a meeting with Wang Dongming’s successor in Sichuan, provincial Party Secretary Peng Qinghua 彭清华 and vice-Party secretary Deng Xiaogang 邓小刚, noted for his previous posting in Tibet. According to Chinese media reports, he was accompanied by Jan Kohout, advisor to president Zeman, and the Czech consul in Chengdu, Karel Šrol. Filip says he also met with Huawei representatives, who explained to him that there’s nothing to worry about. Soon after returning to Prague, he defended the company on national television and radio, essentially denying the existence of article 7 of the National Security Law (Chinese original here). In his TV appearance, Filip kept repeating that it’s all just a competition struggle “between two or three companies”, without offering an explanation of how would several Czech intelligence agencies get involved in such a seemingly mundane affair. Appearing not entirely sober, he dismissed the other participant in the program, an MP for the Czech Pirate Party, as a “neoliberal anarchist”. The moderator and the other guest having difficulty keeping a straight face during Filip’s arguments. The irons are for instance transmitters or big servers, where it is saved. Papers, that’s the software, that does not have to be related to Huawei, that we can create ourselves. An examination of the value of this argument from a legal or computer-science perspective exceeds the remit of this post; suffice it to say that the Czech intelligence warning against the use of Huawei and ZTE equipment in critical infrastructure explicitly referred to both software and hardware. Now, does liaison work work? It remains to be seen whether the peculiar arguments of such ILD partners as Vojtěch “Falmer” Filip will manage to convince many Czechs and Poles to support Huawei against their intelligence services. Regardless, the incident illustrates the importance of United Front, liaison and ‘friendly contact’ work as tools of CCP foreign policy.